Binding will describes how client will communicate with service. 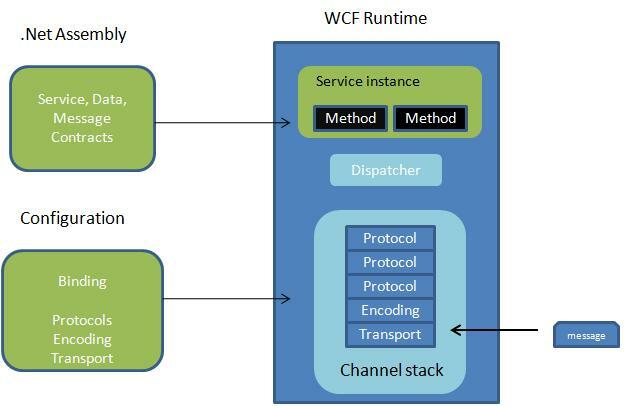 There are different protocols available for the WCF to communicate to the Client. You can mention the protocol type based on your requirements. TransportDefines the base protocol to be used like HTTP, Named Pipes, TCP, and MSMQ are some type of protocols. Encoding (Optional)Three types of encoding are available-Text, Binary, or Message Transmission Optimization Mechanism (MTOM). MTOM is an interoperable message format that allows the effective transmission of attachments or large messages (greater than 64K). It is suitable for communicating with ASP.NET Web services (ASMX)-based services that comfort with WS-Basic Profile conformant Web services. This binding uses HTTP as the transport and text/XML as the default message encoding. It is fairly weak on interoperability. Defines a secure, reliable, interoperable binding suitable for non-duplex service contracts. It offers lot more functionality in the area of interoperability. It supports WS-* functionality and distributed transactions with reliable and secure sessions using SOAP security. It uses HTTP and HTTPS transport for communication. Reliable sessions are disabled by default. This binding is same as that of WSHttpBinding, except it supports duplex service. Duplex service is a service which uses duplex message pattern, which allows service to communicate with client via callback. In WSDualHttpBinding reliable sessions are enabled by default. It also supports communication via SOAP intermediaries. This binding support federated security. It helps implementing federation which is the ability to flow and share identities across multiple enterprises or trust domains for authentication and authorization. It supports WS-Federation protocol. This binding provides secure and reliable binding environment for .Net to .Net cross machine communication. By default it creates communication stack using WS-ReliableMessaging protocol for reliability, TCP for message delivery and windows security for message and authentication at run time. It uses TCP protocol and provides support for security, transaction and reliability. This binding provides secure and reliable binding environment for on-machine cross process communication. It uses NamedPipe protocol and provides full support for SOAP security, transaction and reliability. By default it creates communication stack with WS-ReliableMessaging for reliability, transport security for transfer security, named pipes for message delivery and binary encoding. This binding provides secure and reliable queued communication for cross-machine environment. Queuing is provided by using MSMQ as transport. This binding provides secure binding for peer-to-peer environment and network applications. It provides full support for SOAP security, transaction and reliability. Binding can be configured either through configuration file or Programming. Let us see the binding representation in each method. In the configuration file of the hosting application, you can add the <bindings> element inside the <system.serviceModel> element and add the properties to particular binding type. Properties corresponding to the particular binding type can be mentioned below. Name of the binding properties that you are going to use has to be mention in the end point. In the following code, I have created the WSHttpBinding object and assign the properties which to be configured. This binding object is added to the Service endpoint for client communication. Similarly you can also create any type of binding and add to endpoint. Note: It is always good if you configure the binding properties using configuration file, because while moving to the production you no need to change in the code and recompile it. It is always good practice to represent in the configuration file. Exposing the metadata using HTTP-GET has a disadvantage, such that there is no guarantee that other platforms you interact will support it. There is other way of exposing the using special endpoint is called as Metadata Exchange Endpoint. You can have as many metadata exchange endpoints as you want. It is basically Uri to identify the metadata. You can specify as address in the endpoint but append with "mex" keyword. For example "http://localhost:9090/MyCalulatorService/mex"
There are four types of bindings supported for metadata exchange. They are mexHttpBinding, mexHttpsBinding, mexNamedPipesBinding, mexTcpBinding. IMetadataExchange is the contract used for MEX endpoint. WCF service host automatically provides the implementation for this IMetadataExcahnge while hosting the service. You can create the Metadata Exchange Endpoint either Administrative (configuration file) or programmatically. In the configuration file of the hosting application, you can add metadata exchange endpoint as shown below. Create the ServiceMetadataBehavior object and add to Service host description. 3. Add the endpoint to the service host with address, binding and contract. Complete code for hosting the service with metadata exchange endpoint is shown below. Windows Communication Foundation (WCF, formerly known as Indigo) is built upon the foundation of web services messaging and related standards, while at the same time makes it possible to serialize messages in a more compact binary format, or in a more proprietary way. Still, the core message can always be represented in XML, therefore be considered compatible with any platform that understands XML, and agrees on the contract that defines said messaging between systems. A data contract is a formal agreement between a service and a client that abstractly describes the data to be exchanged. Data contract can be explicit or implicit. Simple type such as int, string etc has an implicit data contract. User defined object are explicit or Complex type, for which you have to define a Data contract using [DataContract] and [DataMember] attribute. t defines how data types are serialized and deserialized. Through serialization, you convert an object into a sequence of bytes that can be transmitted over a network. Through deserialization, you reassemble an object from a sequence of bytes that you receive from a calling application. We need to include System.Runtime.Serialization reference to the project. This assembly holds the DataContract and DataMember attribute. Create user defined data type called Employee. This data type should be identified for serialization and deserialization by mentioning with [DataContract] and [DataMember] attribute. Implementation of the service class is shown below. In GetEmployee method we have created the Employee instance and return to the client. Since we have created the data contract for the Employee class, client will aware of this instance whenever he creates proxy for the service. On client side we can create the proxy for the service and make use of it. The client side code is shown below. Message is the packet of data which contains important information. WCF uses these messages to transfer information from Source to destination. WCF uses SOAP(Simple Object Access Protocol) Message format for communication. SOAP message contain Envelope, Header and Body.SOAP envelope contails name, namespace,header and body element. SOAP Hear contain important information which are not directly related to message. SOAP body contains information which is used by the target. Simplex - It is one way communication. Source will send message to target, but target will not respond to the message. Duplex - It is two way communication, both source and target can send and receive message simultaniouly. As I said earlier, WCF uses SOAP message for communication. Most of the time developer will concentrate more on developing the DataContract, Serializing the data, etc. WCF will automatically take care of message. On Some critical issue, developer will also require control over the SOAP message format. In that case WCF provides Message Contract to customize the message as per requirement. WCF supports either RPC(Remote Procedure Call) or Message style operation model. In the RPC model, you can develop operation with Ref and out parameter. WCF will automatically create the message for operation at run time. In Message style operation WCF allows to customize the message header and define the security for header and body of the message. Message contract can be applied to type using MessageContract attribute. Custom Header and Body can be included to message using 'MessageHeader' and 'MessageBodyMember'atttribute. Let us see the sample message contract definition. When I use this EmployeeDeatils type in the service operation as parameter. WCF will add extra header call 'EmpID' to the SOAP envelope. It also add Name, Designation, Salary, Location as extra member to the SOAP Body. Service operation will accept and return only message contract type. Other data types are not allowed. Note: If a type has both Message and Data contract, service operation will accept only message contract. Service that we develop might get error in come case. This error should be reported to the client in proper manner. Basically when we develop managed application or service, we will handle the exception using try- catch block. But these exceptions handlings are technology specific. In order to support interoperability and client will also be interested only, what wents wrong? not on how and where cause the error. By default when we throw any exception from service, it will not reach the client side. WCF provides the option to handle and convey the error message to client from service using SOAP Fault contract. Suppose the service I consumed is not working in the client application. I want to know the real cause of the problem. How I can know the error? For this we are having Fault Contract. Fault Contract provides documented view for error accorded in the service to client. This help as to easy identity the what error has accord. Let us try to understand the concept using sample example. Step 2: On client side code. Exceptions are handled using try-Catch block. Even though I have capture the exception when I run the application. I got the message that exceptions are not handled properly. Step 3: Now if you want to send exception information form service to client, you have to use FaultException as shown below. Step 4: Output window on the client side is show below. Step 5: You can also create your own Custom type and send the error information to the client using FaultContract. These are the steps to be followed to create the fault contract. Define a type using the data contract and specify the fields you want to return. Decorate the service operation with the FaultContract attribute and specify the type name. Raise the exception from the service by creating an instance and assigning properties of the custom exception. Step 9: On client side, you can capture the service exception and process the information, as shown below. DreamHost is definitely one of the best hosting company with plans for any hosting requirements.